When I went to DevoXX France, everyone was talking about Cloud Services, like Cloudbees or Heroku. I didn’t looked before at those services, but I was able to do it last week ! What do i want to test. I am using BitBucket Git platform for many of my projects, and I use Jenkins as A continuous Intergration Server. Cloudbees offers a Jenkins Instance on the Cloud, So The first Think I want to try is Jenkins Build from my BitBucket Projects. But many of my projects are private, so Cloudbees should not be able to acces my repositories. BitBucket use ssh keys to authenticate users on repositories. So in order to give Cloudbees acces to my BitBucket Repositories i had to add the Cloudbees public key to my BitBucket[BitBucket Account. – Then in the Jenkins settings page find the [Cloudbees][Cloudbees] DEV@Cloud Authorization section and copy the [Cloudbees][Cloudbees] Public Key. – Now go on BitBucket and go to your account settings, and select SSH Keys on the left menu. 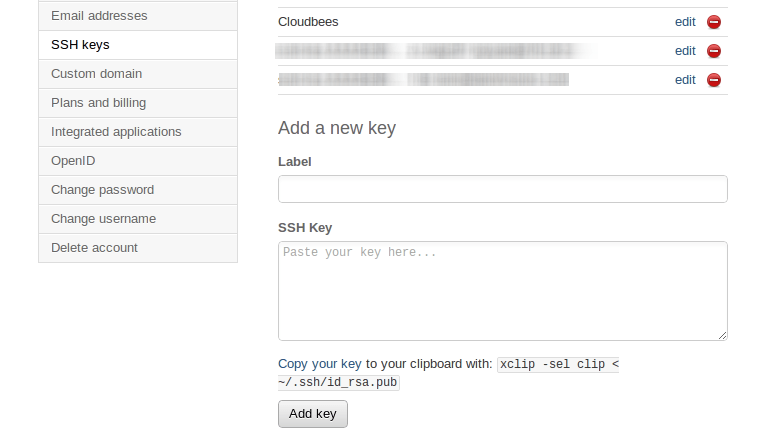 In the SSH Keys page fill the Add a new key form with a name (cloudbees for example) and paste the key you’ve just copied on step 2. Then submit the form. Heroku also use Public Keys for authentications. So you’ll need to add the Cloudbees Jenkins Public key to Heroku. This Should work once, but the second time the job will run, it will fails because heroku remote already exists … simply remove the first line of the shell script.